Please type your comments directly in the reply box - DO NOT copy/paste text from somewhere else into the reply boxes - this will also copy the code behind your copied text and publish that with your reply, making it impossible to read. Our apology for the inconvenience, but we don't see a convenient way of fixing this yet. This introduction refers to the second of our Four Essential Features of the freestyle stroke. Skate Position is the start and the finish position for every stroke in freestyle. It is the most streamline shape you will be in during the stroke cycle, and the moment you will experience the most forward movement. Skate Position is how you deliver the flow of force through the body into forward motion. In this position, your body line most easily parts water molecules ahead so that your body can occupy that space instead. The more smoothly, the more uniformly and therefore the more quickly those water molecules move out of the way, the faster you will travel forward. Skate Position is the most important skill of all because it is determines much of how well you convert effort into forward motion and it is the platform on which you swing the recovery arm forward and the platform on which you take an easier rhythmic breath. You cannot practice Skate Position too much because there are so many ways to make it better, stronger, more stable. 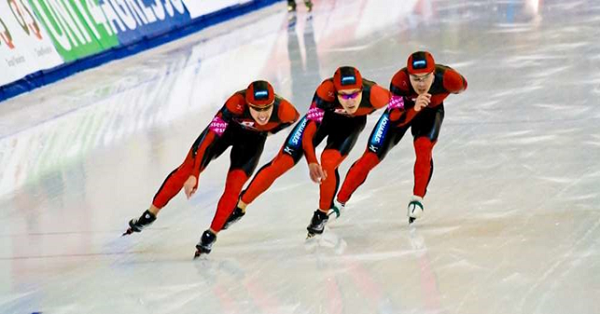 Imagine how a speed skater places her weight confidently on the skate and transfers the wave of momentum into that skate to accelerate forward. That skate blade is long, straight, sharp, and stable. It receives the wave of force and conducts it onto the ice and the skater slides forward. The skater is holds herself with stability on that single skate, over one side of the body, while drawing the other leg forward, getting ready to unleash another wave of force into the other skate on the other side. Stability in this position is crucial to maintaining rhythm and momentum. The Skate Position is named so (I believe) because of its relationship to this action in ice skating. In Skate Position in the water, you are shaped into your most streamline position, holding a slightly rotated angle, while leaning (laying your weight) onto that Skate side of the body. That Skate side of the body receives the wave of force you generated in the stroke and conducts it forward into the lead arm and leading edges of the body to put that force to work parting water molecules ahead. You hold this position with stability that comes from core muscle strength and control, while the other side of the body brings up the recovery arm to prepare to unleash another wave of force into the Skate Position on the other side.